« Goodbye, Waity Katie! Hello, Princess-in-Waiting! 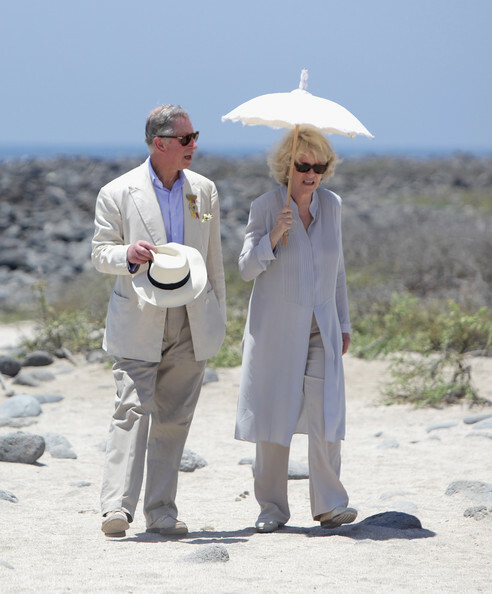 HRH Prince Charles, Prince of Wales and his wife Camilla, Duchess of Cornwall, walk along the beach on North Seymour Island on the second day of a tour of the Galapagos on March 17, 2009 in Galapagos, Ecuador. Charles, the Prince of Wales has indicated for the first time that his second wife, the Duchess of Cornwall, nee Camilla Parker Bowles, could become “Queen Camilla” when he ascends to the throne. But in an interview on the US television channel NBC, he suggested the Duchess “could be” given the title of Queen. The proposed title of Princess Consort was concocted under the previous Labour government to minimize controversy when the Prince married his unpopular second wife in 2005. Camilla was Charles’s mistress during his marriage to the late Princess Diana, and is blamed for the break-up of their marriage. he should be more concerned about his being King first! Besides his mother may out live them both. It is very interesting to watch unfold…. Heavens, please don’t let that happen! Can you imagine the uproar that having Camilla as Queen would cause? I don’t know why, but this almost reminds me of Anne Boleyn and King Henry. .. . Thanks for keeping up the wonderful posts! I think the British people would accept Queen Camilla; do you? Alice had actually been more helpful to Edward VII with matters of policy and diplomacy than Alexandra, according to biographer/historian, Christopher Wilson. At the time they became entwined, Edward was 56, and still Prince of Wales and Alice was 22. How does this relate to the present? Well, Edward VII’s great-great grandson is Charles, also Prince of Wales, and heir apparent. Alice Keppel’s great-great granddaughter is Camilla Parker-Bowes, formerly mistress of, and now the second wife of Charles, and now styled as the Duchess of Cornwall, also bearing the titles of Princess of Wales, Duchess of Rothesay and Countess of Chester. Hmmmm… is history repeating itself? Sort of eerie, don’t you think. Though I am NOT a fan of Camilla’s (she has more of a horse-face than most of the occupants of the royal stable and has obviously been “rode hard and put away wet” more than a few times) I don’t see how anyone can stop Chuck from doing whatever he bloody wants IF he ever becomes King. Neither of them earned my respect but I doubt I’m the only one….and that either of them really give a flyin fig. I must ask, does anyone else think Chuckie has grown a moustache in this pic? Perhaps it’s a caterpillar that’s taking a break on his top lip–or just a bad angle. If I recall, Cami told Chuckie that one of her grandmothers had been one of his Royal Grandpappy’s mistresses. Correct? I also remember that Parker-Bowles, her first hubby, had said he was a faithful servant because he “laid his wife down for the future king”–which made me wonder how a woman’s husband could brag about his wife cheating on him! I’ve heard of some ridiculously outdated rules of “Royal Protocol”, but that was just WAY too twisted for me! Then, when you look at some of the things Princess Margaret was notorious for, instead of flying a “freak flag”, they fly the “Royal Standard”! Vonya, the men who have been cuckolded by British kings have often considered themselves honored by such tribute. Weird but true.